During summer playtime, when the gettin’s just too good to stop for a full lunch, we reach for handy energy snacks. But “natural” bars and electrolyte-replacement drinks can be laden with weird ingredients and reconstituted corn byproducts. And what’s with all this goo-paste, anyway? Thankfully, some local companies don’t sacrifice taste and simple, whole-food ingredients for the amount of pick-me-up. Pro Bar (TheProBar.com) outgrew its original Park City home, so the company moved to Salt Lake City in 2009. Now, it offers three product lines: original whole-food meal-replacement Pro Bar; superfood snack bars Fruition; and a brand new line of healthy “candy” bars, Halo. All are vegan and blended rather than baked for nutrient retainment. 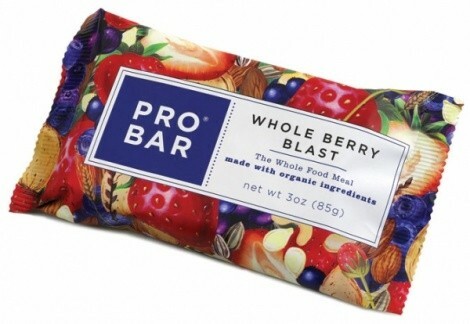 A Pro Bar boasts 15 whole foods—which are not processed, pureed or isolate forms of the ingredients—loads of energy-sustaining, quality fats and nearly 400 calories, which actually works as a meal replacement. Try Whole Berry Blast, Superfood Slam and Cocoa Pistachio. Spencer Taylor’s love for “hot mush” is what launched his Provo-based Rokit Fuel (RokitFuel.com) into the biz. The original product—a hot-cereal cup—is dense enough for endurance athletes and tasty enough to satisfy nearly anyone else. For a quick lift, try the recently launched Booster Bars. Delicious dark chocolate covers two of the four varieties—which hard-working athletes deserve—and they are all packed with whole grains, fruits and nuts. Rokit Fuel also offers various energy mixes; try the Stud Muffin, if for nothing else than the name. Wash it all down with tasty, low-sugar electrolyte replacements from Ogden-based Trace Minerals Research (TraceMinerals.com). Sure, water is good, but enhanced beverages provide rapid hydration, decrease muscle cramping and increase endurance. Trace’s Electrolyte Stamina product packs electrolytes and 1,200 mg. of vitamin C and is available in tablet form, in two super-concentrated liquids—Endure and 40,000 Volts—and in “fizzing” drink tablets.